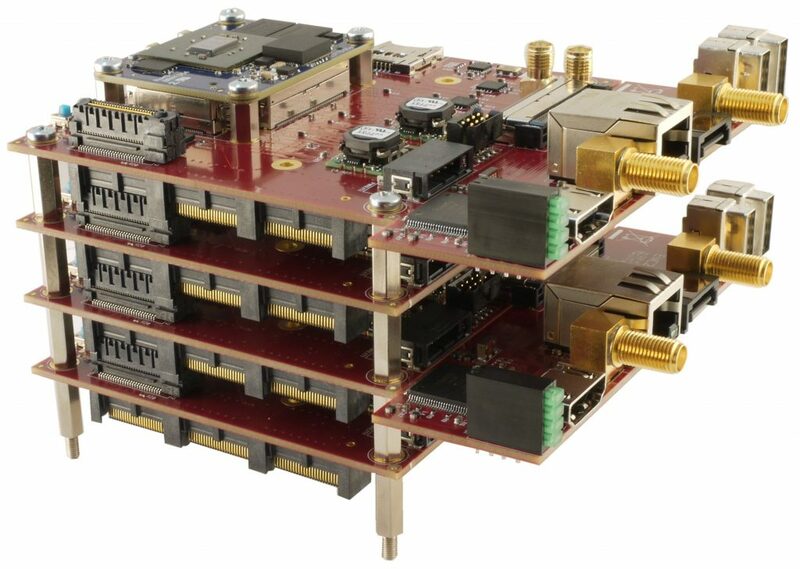 The EMC²-Family is a PCIe/104 OneBank™ stackable carrier concept for a ‘System-on-Module’ design that offers ARM-CPU and FPGA processing power and a VITA57.1 FMC™ LPC I/O board. The main building block is the EMC²-SoM carrier that will accommodate a 40mm x 50mm ‘SoM’ that can either be a Xilinx Z7015/Z7030 Zynq SoC Dual ARM9 CPU, an Artix-7 A100/A200 FPGA, Kintex-7 K70/K160/K325/K410 FPGA or ZU2EG/ZU3EG MPSoC Zynq + a number of High-Speed I/O interfaces to ‘Real-World’ applications, like PCI Express, USB, Ethernet and ADC/DAC. Different ‘SoMs’ can be designed and integrated to add more embedded features and applications, such as smaller/larger FPGAs, more ARM or Intel CPU cores. The ’SoM’ in an open-standard, as is the PC/104. The PCIe/104 OneBank™ design enables the EMC²-DP to be added to robust and rugged installations for various commercial, medical, industrial and military uses. To enable more versatility the EMC²-DP also incorporates a VITA57.1 FMC™ LPC connector opening up a range of extra possibilities and expansion options.